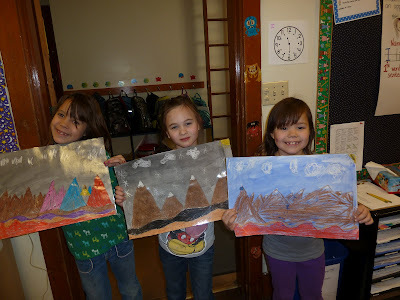 This week we were very creative. We made a landscape of mountains and hills on a piece of paper. 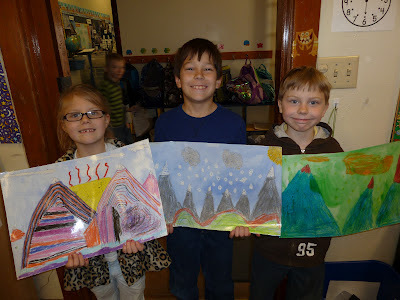 First we practiced drawing different kinds of lines. 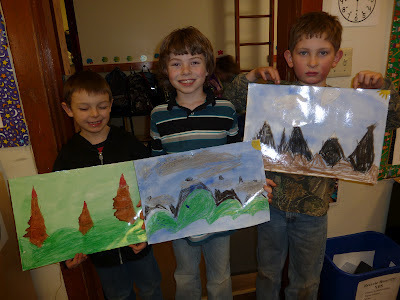 Then we picked a curvy line to draw the hills and a jagged line to draw the mountains. Then we chose color crayons that we liked and colored our pictures in. We had to push really hard with our crayons. Then we did a wash over our coloring. A wash is when you take some water color paints and paint over your drawing. It is a good idea to use more water than paint when you do a wash so the paint won't cover up your drawing. 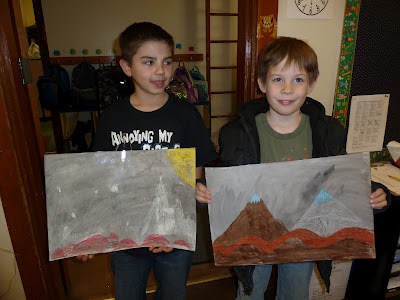 We also wrote poems about mountains. They are special kinds of poems called "found poems." 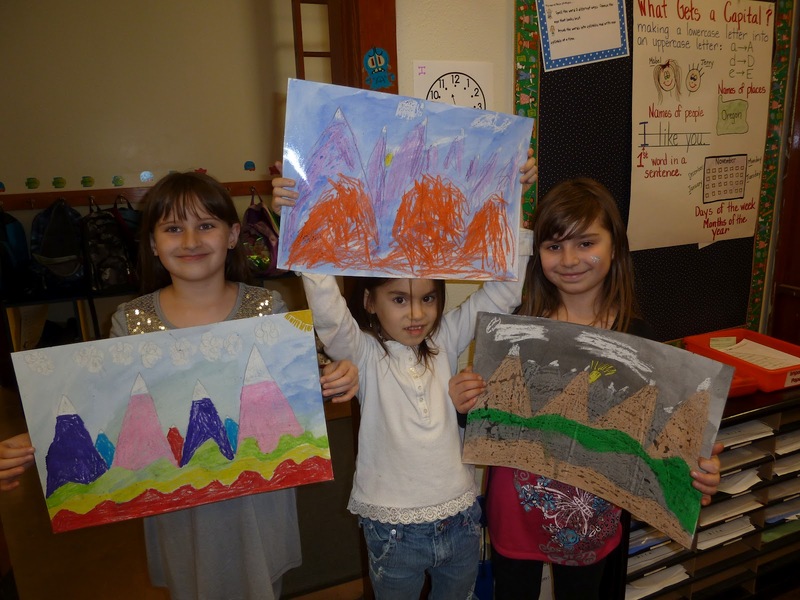 We read information about mountains. Then we highlighted the words and phrases that we liked. After that we read the phrases and words we highlighted to make sure we liked how our poem sounded. Then we wrote down the poem on a piece of paper. Have you ever done this kind of art or writing before? Phew! We just finished up another busy and EXCITING week at our school. Over the past few days we learned about elapsed time, counting coins, chemical reactions, writing letters and speeches, exploring and using new websites such as Glogster EDU and Arcademic Skill Builders, typing using Google Docs and last but not least, giving speeches! Today we wrapped up our study of Biographies by presenting the research we did over the past 3 weeks during a "Wax Museum." This morning we dressed in our costumes, grabbed a few props and opened our museum to our K-1 friends. We were really nervous but very excited to share what we had learned. Later in the day we opened our museum again for our families and introduced them to many famous people such as Jim Thorpe, Michelle Obama, Betsy Ross, Abraham Lincoln, Eli Manning, Babe Ruth, Sacagawea, Barack Obama, Juan Ponce de Leon, Thomas Jones, Jacqueline Kennedy, Rosa Parks and Amelia Earhart. Here are a few photos of us during our Wax Museum. We are hoping to post a few videos of our speeches sometime next week. Special guests learn about Amelia Earhart. Special guests learn about Rosa Parks. Jim Thorpe shares his life story. Sacagawea pulls in a crowd! Babe Ruth and special guest. Betsy Ross shares her life story. When the museum closed students shared biographies with their families. We almost forgot! We had a Valentine's party this week too! Here is a picture of our "booty." We also got spoiled by our high school helper. She brought us cookies and Capri Suns. Thanks Mikayla! All of us with Mikayla. All of us with Mrs. Williams.